Posted on October 13, 2017 at 3:51 pm. Posted on March 28, 2017 at 3:28 pm. Left: Former Peter Stuyvesant Post Office. Center: Height allowed (8 stories). Right: Height requested 12 stories). Compare the heights above. Compliance is 8 stories. Proposed is 12. Like the EVCC, our colleagues in preservation, ommunity Board 3, and many residents, we believe you will agree that this building is oversized and way out of scale. We worked hard to get special zoning put in place — to prevent exactly this. We need your voice. Tell the BSA we stand behind our zoning. We believe the developers claims “hardship” because of “unique circumstances” are bogus. Do not let them get away with cramming an oversized building into a space where it doesn’t belong just because it is on 14th Street. The back of the building goes through to 13th Street and will be very visible, have widespread effects and sets a bad precedent. We must stand up to this encroachment and uphold our zoning. EMAIL THE BOARD OF STANDARDS AND APPEALS via this form. URGE THEM TO REJECT THE VARIANCE! TESTIFY AT THE BSA HEARING – January 24th at 1pm – BSA hearing room, 22 Reade Street, Spector Hall. FORWARD BY EMAIL or PRINT OUT this flyer and post it in your lobby or community center, distribute to friends, neighbors, local businesses. Posted on February 8, 2017 at 5:45 pm. Join elected officials, community organizations and activists to ask Mayor de Blasio to be our Valentine and give us back our Community Center former CHARAS El Bohio, P.S. 64 at 605 East 9th Street! Artists, dancers, actors, musicians, residents, community not-for-profit orgs. & service providers. Come as your favorite cultural or community resource, or come as you are! Print out the Valentine’s Rally flyer and distribute to friends, neighbors, local businesses.  Ask your favorite businesses to post it in their window.  Urge him to reverse the Department of Buildings’ ruling and not allow a phony “dorm for hire” to go into old P.S. 64. In 2005 community members, organizations and elected officials joined to get Old P.S. 64 landmarked and the City limits uses here to “community facilities.” As the developer tried repeatedly to get around the the usage restriction by making it a “dorm for hire,” so our community allies asked the City to tighten up the dorm rules. 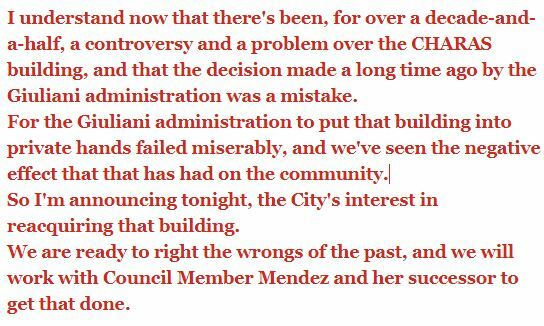 The developer owner is trying yet again to sneak around these tighter rules and has hired the same lobbyist involved in the scandalous lifting of the deed restriction for the nearby Rivington House! And what’s worse is now it’s the DoB breaking it’s own rules! That has terrible implications, not just for our beloved CHARAS El Bohio, but for endangered, culturally significant buildings across the City. 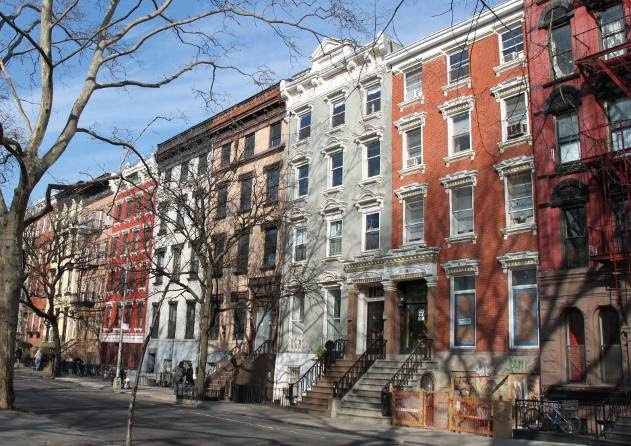 Read more on recent happenings at The Villager and at GVSHP or find a full history here. 432 E. 14th St. TOWER – 1/24 OPPOSE Variance Application! Posted on January 18, 2017 at 2:14 pm. NO Taller than Zoning Allows! Tuesday Jan. 24th at 1pm – Testify at the BSA Hearing! The developers of 432 E.14th Street have applied to The Board of Standards and Appeals for variance to build higher than our zoning allows — 50% (four floors) higher! Compare the heights above. Compliance is 8 stories. Proposed is 12. Like the EVCC, our colleagues in preservation, Community Board 3, and many residents, we believe you will agree that this building is oversized and way out of scale. We worked hard to get special zoning put in place — to prevent exactly this. We need your voice. Tell the BSA we stand behind our zoning.